Let’s pretend this is a really difficult recipe for Stuffed Pepper Soup. That you worked hard all day to put it on the table for your family. Because really, it’s so. stinkin’. easy. Read on for both crock pot and Instant Pot directions. Is this Weight Watchers Stuffed Pepper Soup? Yes! For Weight Watchers this is 1 Freestyle Smart Point per serving when using 99% lean ground turkey! 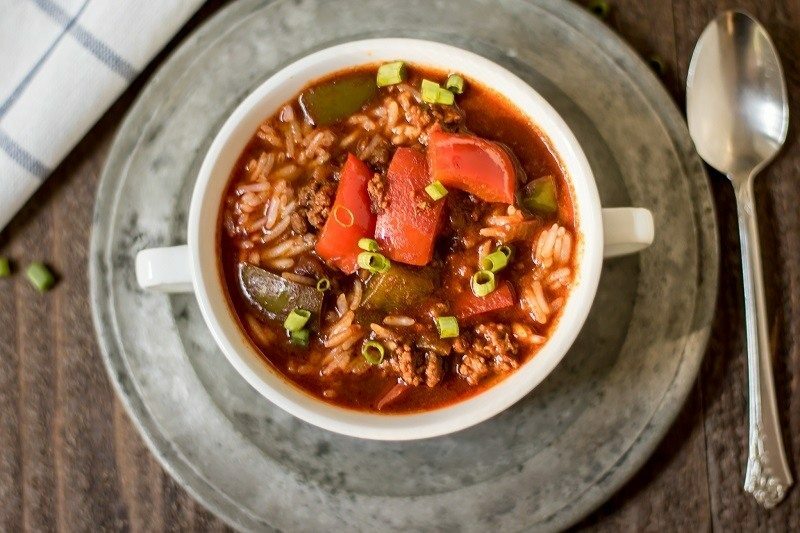 I love adding different colored peppers into this recipe and making the soup as colorful as possible–it’s become a bit of a challenge for me lately to see how many colors I can add to our meals. I’ve found these beautiful red and yellow striped peppers at our local Safeway a few times and they make the perfect addition to this recipe. They also garner a ton of compliments on a fresh veggie platter! Recently, I’ve started to make this soup in the Instant Pot! Of course, you can use the slow cooker function on the Instant Pot, but I prefer sautéing the meat and using the Instant Pot to make this truly a one pot meal. Directions on doing this are below. 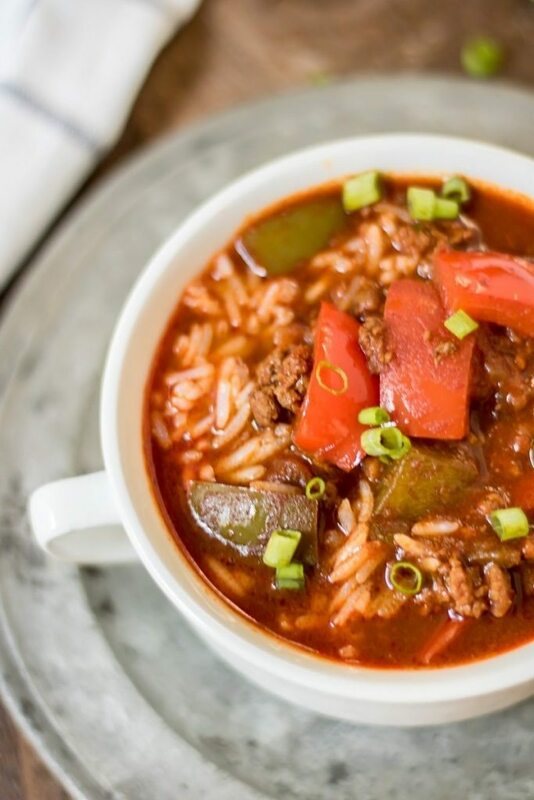 I’m sharing with you two different ways to make this easy stuffed pepper soup recipe. You can make this stuffed green pepper soup recipe in the Crockpot or in the Instant Pot…either way, it’s very easy! 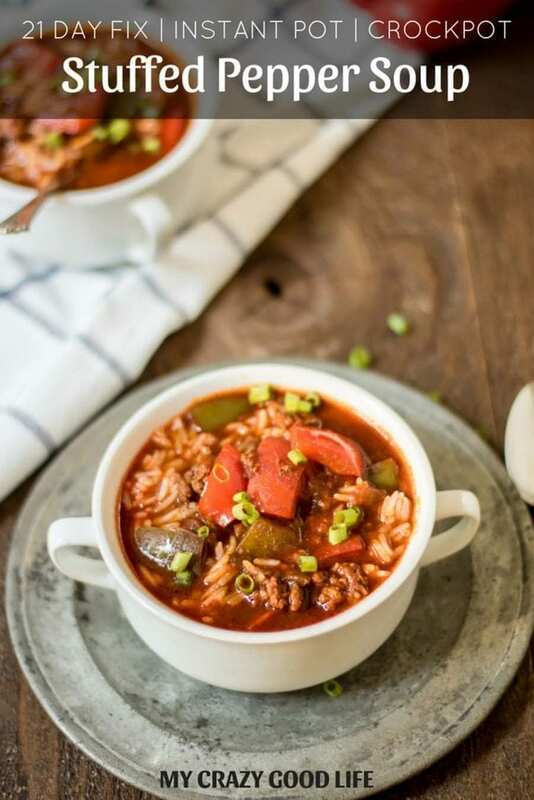 I like making my healthy stuffed pepper soup recipe in the Instant Pot because it’s quick and I don’t have to worry about planning very far ahead! My healthy stuffed green pepper soup has a ton of nutrition info at the bottom of the post in the printable recipe. If you’re on a specific nutrition plan, please make sure you double check these counts. Check your chili seasoning to be sure but otherwise, yes! 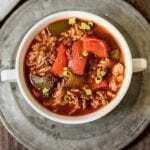 This stuffed pepper soup recipe is gluten free! It’s perfect for making when friends and family are coming over and they have dietary restrictions! They’ll think you’ve gone out of your way to create such a delicious meal for them (I won’t tell them how easy it is). In my world, making the best stuffed green peppers is all about ease. I want the amazing flavors but I don’t want to work super hard for them…in comes my Crockpot or my Instant Pot! This particular recipe is amazing and so delicious because it can be made in either the slow cooker or the programmable pressure cooker without much fuss. A quick and easy weeknight meal that the whole family actually loves…in my world it doesn’t get better than that! 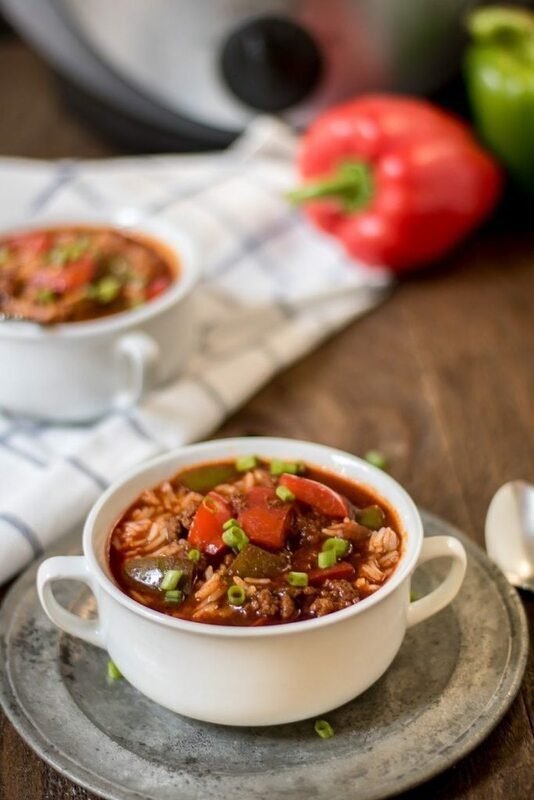 This is a really easy slow cooker stuffed pepper soup recipe…in just a few steps you’ll have the most delicious and family friendly meal ready and on the table. If you want to switch it up, don’t do the stuffed pepper soup Crockpot thing…use your Instant Pot! Saute the meat and onion, then add peppers, tomatoes and tomato sauce, broth, and spices. Don’t forget if you are using an Instant Pot you might need to adjust cooking times for altitude changes…I know, it’s surprising! Here’s an easy to follow cheat sheet to convert the times! Looking for more delicious recipes? I have a ton of them–all family favorites–for the Instant Pot, crock pot, and more! Click here to head over to all of my favorites! For Weight Watchers this is 1 Freestyle Smart Points per serving when using 99% lean ground turkey! What is the cup measurement for 1/8 of the recipe for 21 day fix? When I do the calculations from the nutrition you list I come up with 7 points. Am I doing it wrong? I just re-calculated it for FSP and actually get 1 per serving. 99% lean turkey, onions, tomatoes, and peppers are 0 points. Beef broth is 1 point for 3 cups, and brown rice is 7 points for 1 cup. Divided by 8 servings, it’s 1 point per serving. Excited to make this today! !How many WW points would this be if I used 93% ground turkey? You could definitely cut the amount in half!! What’s the serving size for 247 cal?